Magnificently restored 1960 Li 125 Series 2. UK Registered. The Lambretta is an Italian automotive icon, instantly recognisable from the 1960s to the present day. The bikes were originally produced in Milan, Italy by Innocenti. In 1972 the factory was bought by the Indian government, however it is the 50s and 60s bikes that remain the original and most sought after examples. We have a number of a perfectly restored Lambrettas; from a 1957 Model 48 up to a 1966 Li 150 Special in stock and ready to find a new home. All of the bikes remain in complete period specification, but have benefited from extensive restoration work in recent years. This particular example has recently enjoyed a zero kilometer restoration, entirely from original Italian parts. 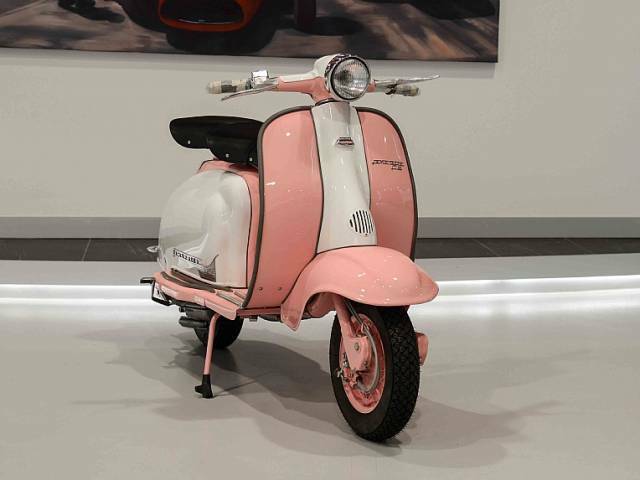 Finished in a beautiful Pink and White two-tone scheme, this Lambretta is not only one of the nicest, but also most striking examples for sale today.